This summer we’ll interrogate that thesis. Every week I’ll post three versions of the same real-world task. Please tell me: who wore it best? What do their differences say about their authors’ beliefs about students, learning, and math? Would you make changes? Which and why? We’ll begin with Barbie Bungee, a lesson which is as old as math teaching itself. (The earliest reference I found in an exhaustive #lazyweb search on Twitter was this 1993 Mathematics Teacher article. Thanks, Norma.) If you’ve never heard of it, here is a video summary from Teacher Channel. Click each image for a larger image. Or click through for the PDF. I previewed these problems on Twitter a week ago. A number of people noticed that Version 3 asks for a lot of literacy in addition to numeracy. “Example 3 is too wordy for me and the students that I work most closely with,” said Bridget Dunbar. “A thin start.” Great description. A number of participants in the discussion said variations on, “It depends on the student.” That seems hard to falsify. 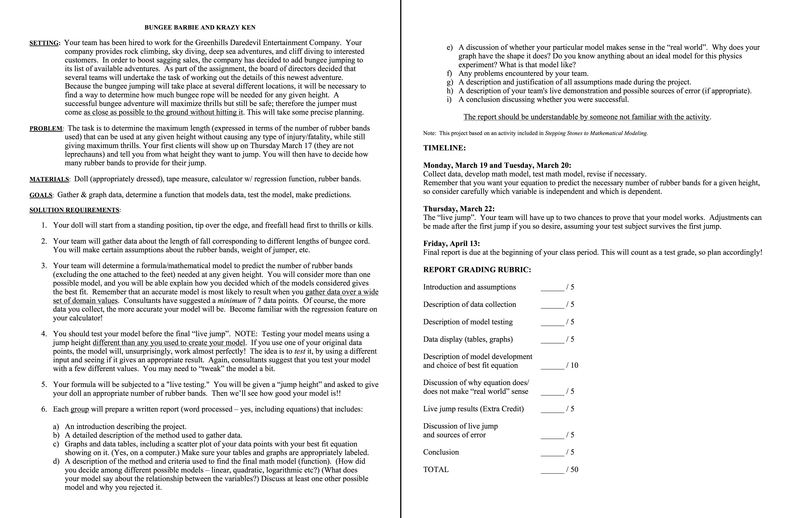 Even if it’s true with these three worksheets, though, I don’t think that advice extends to any version of this task. Some are probably just bad. For my part, I look at each version and try to imagine the verbs, the mental work students do. In each version of the task, the work becomes formal and operational very quickly. Version 1 has students measuring precisely in its first step. Version 2 has students graphing precisely in its first step. That’s important work but once the task has been formalized like that, it’s very difficult to ask students to do informal, imprecise work, which is just as important and often more interesting. Like wondering what kinds of questions a bungee jump operator would wonder. Like sketching the relationship between rubber bands and fall height before graphing it. It’s difficult to load all of those tasks onto the same piece or pieces of paper. Perhaps impossible, as later tasks will provide the answer to earlier tasks. 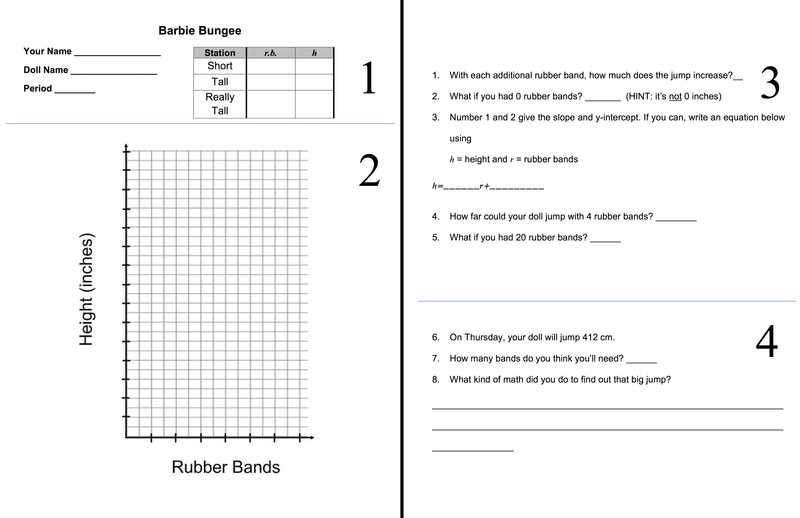 My ideal Barbie Bungee task (and modeling task, in general) requires a dialog between teacher and students, with the teacher adding context, questions, and help, as the situation and students require it. Watch Twitter for next week’s preview. 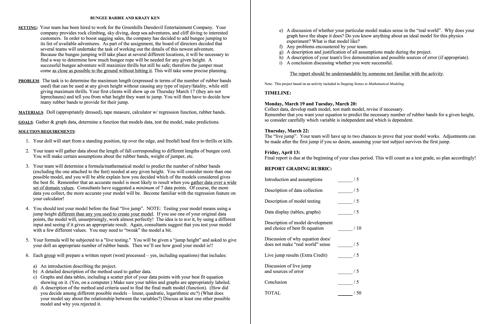 You should find three versions of a task and play along at home. I wonder if the “step by step” worksheets that educators can be so fond of stems from the fear that students wouldn’t know what to do to solve the problem or from the idea that teachers have a vision for what the students’ output should look like. In versions 1 and 2, students will most likely have much cleaner products than those of version 3. I assume it’s some combination of both. I wouldn’t say that it’s so much the case that “it depends on the student” as that it depends on the classroom culture. Teachers that have cultivated a culture of risk-taking, serious inquiry, and other habits of mind and practices that draw on the natural curiosity and need to know and understand that we all have (before it’s schooled out of us) are going to have enormous flexibility in designing or adapting tasks like this one so as to not wind up stifling individual thinking and productive struggle. I wanted to like Version 2 more. In part 2, the independent and dependent variables are labelled. I’m not sure if that’s a big deal. But the author giving away that the rate of change is constant / the model is linear in the first question of part 3 is. I am making the assumption that the Barbie Bungee activity isn’t the students’ introduction to linear relations. (There are tasks that better suit this purpose — Mathalicious’ Domino Effect, for one.) Then again, maybe it is. If students have been learning about linear relations and slopes and y-intercepts, I can’t explain the author’s wording of questions 1 to 3 in part 3 (or speculate on what this says about the teacher’s beliefs). Yes, Version 3 is wordy, but I don’t think that the intent is to simply hand it out and sit back while kids struggle to read it; I see it as supporting a classroom conversation. Tough to say without a lesson plan. 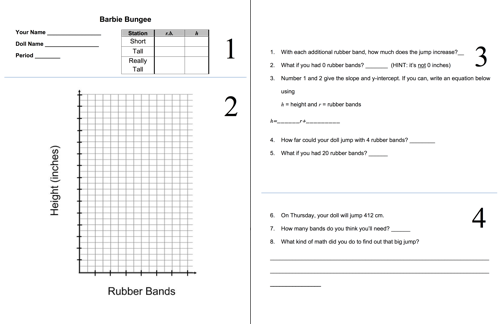 A3: I am finally going to try Barbie Bungee next year after wanting to for so long. Just need the Barbies & I put out a call for donations from colleagues today :) I would structure this task as 3 act math tasks using Pear Deck instead of a paper handout (going slide by slide allows a gradual uncovering of information & ideas). Pear Deck shows a great number line w/ everyone’s guesses too! Act 1: Present video of scenario. I notice / I wonder. Present question “how many elastics to bungee as close as possible w/o hitting the floor?”. Estimate; too low, too high, best guess. Act 2: Hand out Barbies & elastics. Groups collect data. Solve (predict) in any way they like. Act 3: Test our predictions. Consolidate w/ Desmos activity builder to ensure all groups can see how to determine a line of best fit for the data & use the equation or graph to make predictions. Laura, if you have them already made, would you mind sharing your hook video, Pear Deck file, and Desmos activity? They sound like a great. Seems like what drives much curriculum/task writing is fear that, left to their own devices AT ALL, students won’t do anything worth doing (I don’t mean that students wouldn’t go to class or wouldn’t do ANYTHING in class but text and talk to their peers and surf the ‘Net and sleep; that’s a different conversation), and that unless given explicit instruction on exactly what steps to follow in carrying out an investigation, they’ll botch things so badly that they won’t have “good data” from which to learn. Also, many prepackaged tasks have built into them the goal of collecting data from the whole class (whether the tasks are done individually, in pairs, or in small groups): how can you open things up if you need group data that makes sense to combine and analyze? Thinking back to when I tried bringing TI data collection devices into my classrooms in the late 1990s/early 2000s, I have to say that on some level that fear is well-justified (and even worse things can occur). But at that point, it really didn’t occur to me to create more open-ended tasks with less scaffolding. I wanted to see how the technology worked, give them a chance to see that you can collect data from a physical (is that the simpler way of getting at “real-world”) situation, and then apply the math they’d learned or were learning to that data. That process seemed “sufficient” in principle, but frankly it didn’t play out so well in practice for a lot of reasons. I don’t imagine it would have gone dramatically worse if I’d done these tasks with them in a manner closer to the third choice here. And today, I can readily see creating much more open and flexible investigations. I think the drive for group data shouldn’t trump the goal of getting students to think divergently and creatively. Let the class come to the conclusion (at some point in the term) that it wants data from everyone that can be combined and examined statistically or in some other way. How to create such classroom cultures starting on Day 1 seems to me to be harder and more vital than how to take a given task and open it up (that’s not meant as a put-down of the latter process; it’s certainly very important, and for some teachers daunting enough in itself). Would you give any of the above versions of this task to students on the first day or in the first week of class, all things being equal? Or is there a process that you’ve used successfully that builds to a point where you can give something closer to Version 3 than either of the others, and then continue to build student confidence in dealing with less scaffolded, less directed investigations? I’m excited about this blog series! I took a short hiatus from Twitter so missed the question, but I’ll definitely keep my eyes open for the next one. I think #3 wears it best. I’ve used something similar to #1, and I didn’t quite get #2. #3 leaves the most to the imagination. For #1, I first show a bungee jump video and then get the students to ask questions. Eventually someone will wonder how they know how much bungee to use. Bingo. I then talk about using math to model a situation. So how do they model this? Some kids will say they can use trial and error with some masses on the bungee cord. Some kids will say they do experiments with smaller cords to see how they behave. Bingo again. I then present barbie and her bungees, and what was essentially the same as activity #1. Not ideal, but it was ok. Thanks for the commentary, team. I’ve added comments from Chris Hunter, MPG, and Elizabeth Raskin to the main post. Would you give any of the above versions of this task to students on the first day or in the first week of class, all things being equal? The only comment I’ll add to this interesting conversation (and specifically to your question) is that there is a lot of interesting work we can do before passing any of these versions out. 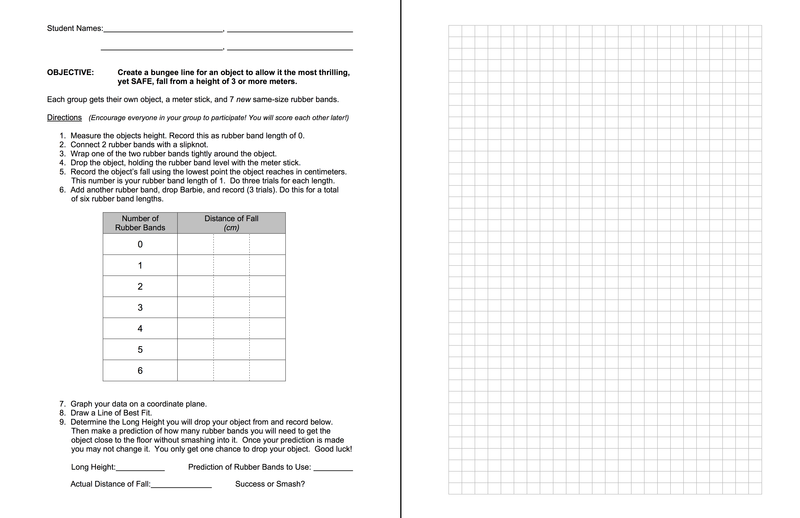 The worksheet, and whatever is on it, can help a student structure her work and thinking. 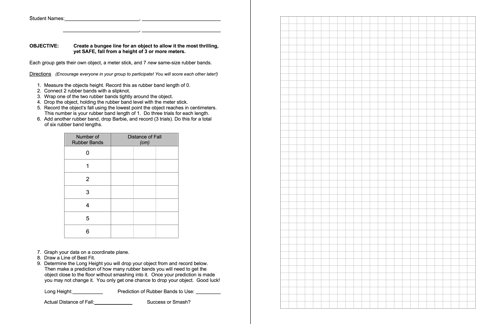 But tables, blanks for questions, empty equations, gridded graphs – those are all too heavy a structure for the initial development of the Barbie Bungee question. I liked version 3 the best, it’s the most easily fixable and has the best context. I think I’d do it in the form of a series of emails. The president of the company wants to start a new product: bungee jumping! He wants it to be amazing, but safe. He attaches a video to show what he means. The marketing gal sez yeah, hey, I know! Let’s guarantee the customer gets no further than 1 foot from the ground! Company lawyer says whoa who whoa, we have to be safe or we’ll be sued! We need to test this. Send everyone to all the popular jumps and let them check it out. Accounting VP says uh, I don’t think so. The budget won’t stand for it. We’ll need to test it first. Simulations would be much better–less risk, less insurance, less cost. Crazy Al, the Engineer: you know, my sister used to throw her Barbies over the porch on a string. No bounce, though. Maybe we could use rubber bands or something. I’d have that be the first handout, and see what happened. This is awesome! Can’t wait for the next one.